Customized jewelry is a fun way to accessorize any outfit, but going out to the nearest retailer to pick up a sparkling new piece can be costly. Instead of spending money at a brand name store, consider repurposing a soda can into a completely unique bracelet. Once the beverage is gone, an aluminum soda can will provide the perfect base material for creating accent pieces that look fantastic as wristwear. 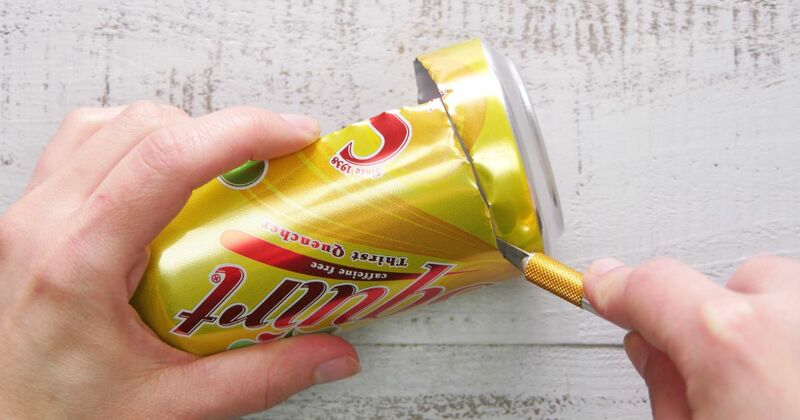 It is simple to stamp out delicate floral detailing on the side of a soda can, and with the right tools, doesn’t take much time. Securing aluminum stamps to a leather band makes for a comfortable and personalized piece of jewelry to add to your larger collection. Simple to size and always adjustable, a soda can bracelet is a beautiful way to give a beverage container a new and aesthetically pleasing purpose. 1. Place a soda can length-wise on a flat surface. 2. Cut a 3-inch horizontal line just below the rounded rim using an X-Acto knife. 3. Cut down the length of the can from the end of the 3-inch line until the bottom rounded rim is reached. 4. Cut 3 inches across the bottom of the can and back up the length for a removeable aluminum rectangle. 5. Stamp a flower out of the aluminum rectangle using the floral stamp and punch. 6. Punch a hole in the center of the aluminum flower with a hand-held hole punch. Repeat this process 11 times so there are 12 flowers in total. 7. Bend away excess aluminum from the center hole using pliers. 8. Place a 12-inch by 12-inch leather square on a measuring place mat. 9. Use a ruler to measure out a leather band that is 11 inches long and ½ an inch wide. 10. Cut the leather band from the rest of the square using a leather cutter. 11. Cut the leather band to 5 1/2 inches long. 12. Punch a single hole into both ends of the band using a leather hole punch staying as close to the edge as possible. 13. 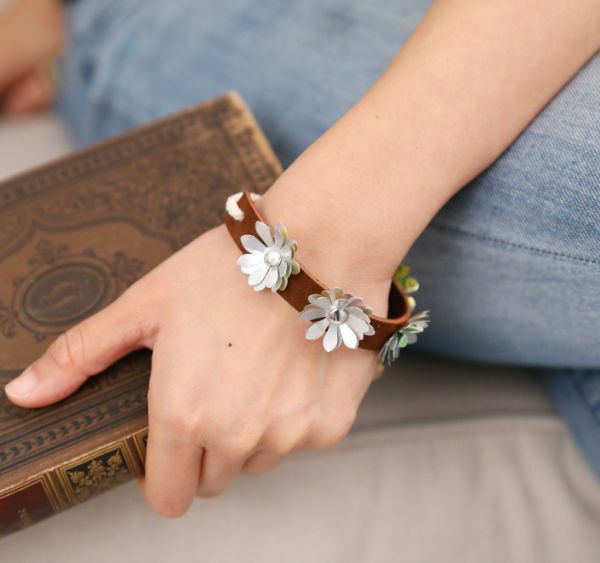 Evenly space four aluminum flowers across the length of the band with the colorless aluminum petals facing up and the hole centered on the band. 14. Mark the center of each flower with a black Sharpie, and remove the flowers. 15. Punch a hole with the leather hole punch at each of the Sharpie marks. 16. Insert a single pin through the second hole from the left edge of the band coming in from the back of the leather with the sharp end facing up. 17. Place three aluminum flowers with the colorless petals facing up directly on top of the pin through the center hole. 18. Place the flat pin backing on top of the sharp end of the pin and center a metal dowel on the backing. Gently hammer the dowel with a rubber head hammer to secure the backing to the pin and keep the flowers firmly in place. Adjust petals as needed once they are attached. 19. Repeat this process for three sets of three aluminum flowers until the four center holes on the band are secured with floral accents. 20. Cut 6 inches of white yarn using standard scissors. 21. Loop the end of the yarn through one end of the leather band from the front and repeat using the other end of the yarn through the hole at the opposite end of the band. 22. Pull the ends of the yarn together to a desired band length and fit, then knot the ends so the bracelet is loose enough to slip on easily. 23. Wear as a stylish accessory with any outfit.